On a dreary late January morning, I join a small group of guardedly optimistic souls to scan the creeks of West Marin’s San Geronimo Valley to glimpse one of the Bay Area’s rarest denizens, the critically endangered coho salmon. With luck, we’d see a few survivors of the batch born here three years ago, returning to their home stream to pass on their genes to the next generation and renew the salmonid cycle of life. It’s a cycle that’s in imminent danger. We know the chances of witnessing a coho homecoming in Lagunitas Creek are slim, especially considering the provenance of this run. The fish, officially called the 2008-2009 cohort, emerged from a total of 26 redds (the spawning beds of salmonids). A shockingly low number. The lowest on record. 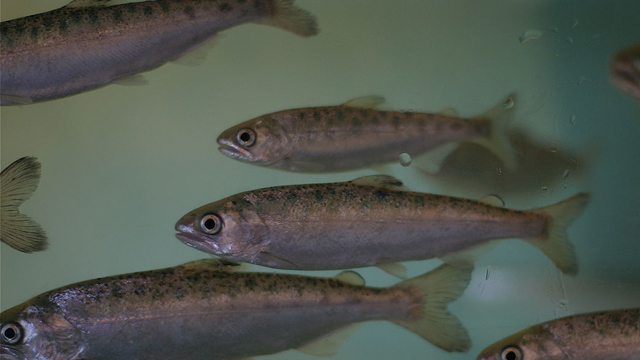 Coho lay between 1,400 and 3,000 eggs (depending on the female’s size), and it’s a good thing, because the salmon lifestyle is fraught with peril. Adults bury eggs in gravel under rocks, but silt from homes built too close to streams can choke the flow of oxygenated water and suffocate eggs. Surviving eggs yield tiny “alevins” that subsist on yolk sacs, hidden among rocks to avoid predatory insects, until they venture into the current as fry. If fry evade kingfishers, herons, and otters, they grow through summer, fall, and winter, barely the size of a ballpoint pen. Finally, as saltwater-ready smolts, they travel downstream to the Tomales Bay estuary, where bigger fish, birds, and hungry sea lions await, then head out to sea. Coho can swim thousands of miles in the ocean, feeding on smaller fish or falling prey to sharks, sea lions, seals, orcas, and fishing boats. It’s a wonder any have come back at all. The steely overcast sky adds a nip to the damp air but makes it easier to spot the battered bodies of the silvery fish, barely moving in the dark waters of the stream, about 30 feet below the trail. They take a beating as they move from salt- to freshwater and carom off rocks, logs, and sundry debris on their way home. Binoculars confirm the blurry white flecks as a female, fighting the current to guard her eggs from predators and other females. With 50% of spawning habitat cut off by dams to sate human water needs, competition for nesting sites is fierce. My excitement turns to sorrow as it hits me: her mission complete, she will soon die. The fish don’t start their improbable journey upstream until the first winter storms send plumes of freshwater, replete with the chemistry and scent of home, into Tomales Bay. The freshwater pulse leads coho by the nose back to their birthplace. But the arid winter, one of the driest on record, cut spawning season short. The vast majority of fish didn’t return until the end of January. We’re seeing the stragglers. A week earlier, Appelbaum braved a hailstorm to scout fish at Roy’s Pools, a few miles down the road. “Sure enough,” he says, “I looked over and saw a fish jump.” Fish can now pass what used to be Roy’s Dam thanks to a chance encounter with a few frustrated fish. SPAWN Executive Director Todd Steiner recalls driving his daughter to preschool when he noticed giant two-foot fish swimming in two inches of water, stuck in gaps of a broken concrete structure in the dam one December morning in 1997. He watched the determined fish jump up, slam into the dam, fall back, and repeat their ordeal over and over. Steiner called an editor at CNN who’d asked him for help on a story about endangered species, and alerted the local media. Soon, hundreds of people turned up at Roy’s Dam to watch the hapless fish. Juvenile survival is the coho’s biggest problem, mostly, thanks to us. We dam their streams for our reservoirs and channel placid waters into raging, fry-shredding flows. We convert floodplain habitat into housing, farms, and ranches. And, worried about floods, we clear fallen trees that give fry refuge from predators. Until the population crashed in 2008, Steiner led emergency rescues, going into small tributaries to scoop up fry stranded in fragmented, evaporating pools and moving them downstream. Since the late ’90s, Steiner and his group have relocated 23,000 juveniles. But in the past few years, fewer and fewer fish have spawned in these tributaries. Even so, coho advocates are buoyed by this year’s census: 130 redds and 340 live fish (though the live census likely includes double counts). Just 60 years ago, hundreds of thousands of coho delivered nutrients and energy to our coastal, stream, and ocean ecosystems. Historic salmon runs probably even shaped inland ecology. Peter Moyle, professor of fisheries biology at the University of California at Davis, traced the flow of marine nutrients from chinook runs in the Central Valley’s Mokelumne River to adjacent vineyards. Living at the southernmost distribution of the species, our coho may prove an invaluable genetic resource in the face of global warming. They’ve somehow learned to adapt to warmer water temperatures, Steiner explains, and may hold a genetic key to understanding how other populations will cope with a warming world. 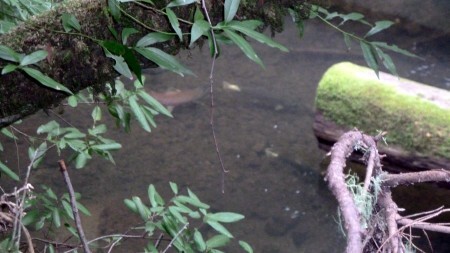 Fish feed the forest: A salmon carcass on the banks of Lagunitas Creek sustains local animals, birds, and even trees. When salmon spawn in high densities, they deliver substantial quantities of marine-derived nutrients to the soil, plants, and trees along stream banks. Biologists are studying how the loss of these nutrients may affect riparian ecosystems. Nearly 90% of coho habitat is on private land. For Steiner, the key to coho survival rests in the hands of Marin County’s Board of Supervisors. We need regulations to move houses back from streams, he says, and keep trees standing so they can capture desperately needed moisture during dry spells. But we all play a part, starting with water conservation. Every drop we waste could offer a lifeline to a species struggling to survive. As I retrace my steps along Lagunitas Creek five days later, the warm sun casts a glare on the rippling water, now opaque. I search for signs of the sacrificial offerings of the week before. 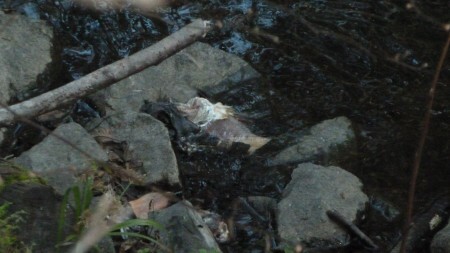 Finally, I notice a carcass on the creek’s edge, pulled up by a raccoon or maybe an osprey. I close my eyes and imagine the forest floor flush with salmon detritus, rowdy with feasting scavengers, as it surely was before dams disfigured the watershed. When I open them, I hear only the sound of rushing water. I’ll write about SPAWN’s habitat restoration efforts, and how you can help, in a future post. Good article, The Lagunitas damns not only block 50% of the watershed they block 70% of the historic spawning grounds. The San Geronimo valley is a wonderful place to live and people that live here have been fighting development for fifty years. The article did not mention the 2006 one hundred year flood which was the years the Lagunitas watershed saw a large drop in the Red count. Also, unfortunatly, it began several years of poor ocean conditions that lead to low Salmon returns. Recently the conditions in the ocean improved and the number of Salmon are increasing. The red count has nearly doubled every year since the 2006 flood and Last year the watershed produced 125% of the streams Juvinile fish carrying capacity. 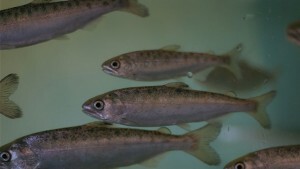 I think it would help many people to the report on how the a valley with people who completely support the return of the Salmon refuse to work with the Spawn organization. Many organizations with good intentions find themselves in difficult positions attempting to achieve their goals. This situation is a perfect example of a good idea gone wrong.